If we were to list all the kitchen faucet styles in existence, you would be here for quite a while. You see, makers of these important bits of kitchen accessory are well aware of the fact that the modern homeowner has changed; in a big way. The person shopping for a faucet does not just need a functional fixture that offers access to water when needed, but rather an important design element works well with the room’s design as well. That is why today, the number of kitchen faucet options is practically endless. Here, you will find a breakdown of kitchen faucets based on some broad categories. The idea is that, with this guide, you will find a means to get the kitchen faucet you need for your kitchen. All the bases have been covered here, and these include traditional, contemporary, and other design outlooks common in the faucet market today. If you lean towards a faucet design that offers an easy one-hand control, then a pull out faucet is something you should seriously consider. You can control both the water flow and temperature in one hand without the need to get acrobatic or let go of whatever you are holding. These faucets also have an inbuilt spray head that allows for movement from the sink to the countertop. This should come in handy in cases you have large pots that cannot be filled easily when within the sink. In contrast to pull out faucets that have spray heads that move from the sink to the countertop, these faucets move in a downward direction. Obviously, these will work best if you have a deep and spacious sink. Granted, faucets with two handles have been around for quite a while, some might even consider them dated. But you should not dismiss this design style just yet. Some people like the convenience of having a separate tap for a given water temperature. And with some modern design innovations, these faucets can look modern and stylish, which means they will fit quite well into modern and contemporary kitchens. 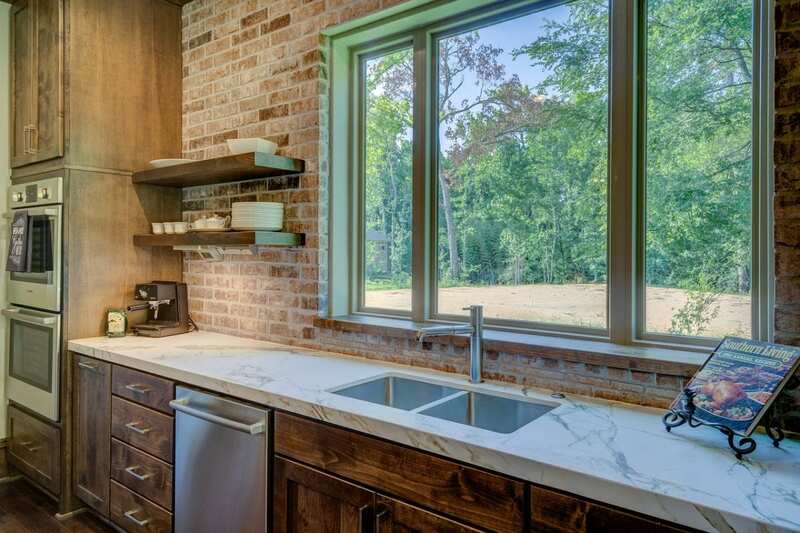 You do not need a commercial kitchen to get a commercial faucet today. That said, there are a number of benefits to having this kind of kitchen faucet. For one thing, it makes the kitchen look more “serious” and professional. This can be an incredibly appealing design feature for many, especially when your sink is centrally located and you need a bold design statement. Today, the commercial design style is polished to ensure that it fits in effortlessly with your kitchen’s style. These are kitchen faucets that can be operated without any physical contact with them. Obviously, if you want a fixture that wows your guests and really stands out for its modern design and innovativeness, this is one of the best options at your disposal. Beyond that, these faucets make a lot of practical sense if you need something that is considerably easier to operate. You do not have to let go of anything in order to turn this faucet off or on. While a faucet with an integrated spray head is pretty much the industry standard, this spray design style is an inconvenience for many people. For many users, a spray head should be a little more versatile than these traditional design styles. That is why considering a faucet that comes with a separate spray head is something worth considering when looking for a kitchen faucet. So, today, when you go to purchase the best kitchen faucets, keep in mind that you have this great option as well. If you are searching for the best kitchen faucets, you will find some reviews online that will list long and confusing lists of what the market currently offers. But here, we have distilled these faucet classes into a few broad categories so that you have an easier time making the right choice. This should make the process of finding the right faucet for your kitchen a lot easier, even in consideration of things like personal style and custom design preferences. Previous PostThe future of housing – what can we expect?